This, my friends, is a sign of the coming apocalypse. 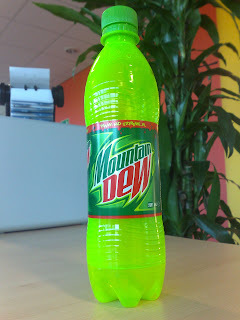 What you see before you is a bottle of Polish Mountain Dew, an almost empty bottle of Polish Mountain Dew. The bottle is coloured the same violent hue of luminous green that is to be found inside in liquid form, in the same manner as poisonous fish proudly bear the brightest colours to warn off all predators with a visual declaration of the terminal fate that will befall them if consumed. I headed no such warnings, and within moments of sighting I had consumed, the brief high of the former addict soon to be replaced by the crashing lows of one who has succumbed too easily and rues the day they ever set eyes on the green temptress that is the Dew. That it exists in Poland but not in Dublin says a lot about national tastes and insomnia. I'm trying to figure out from the list of ingredients what the Polish for 'Brominated Vegetable Oil' is, assuming it is even legal here.